Travel is part and parcel of hagiographic literature. Hermits and monks made journeys to holy places, to graves of martyrs and to holy men before settling down in a monastery or hermit’s cell. From the start, the merit of these travels was debated hotly among monastic thinkers. Many criticized mobility as a monastic practice and wondered about the importance of place as a conduit of sanctity. This debate notwithstanding, for many monks and hermits travel to holy places and to holy men served as kind of preparation for monastic life. Unfortunately, most of the vitae that recount these travels leave rather vague the protagonists’ itineraries and destinations. Adding to the opacity, the hagiographic literature can be careless with respect to time and space. Yet, bearing these difficulties in mind, we can extract much historical information from hagiographical literature, including information on travel before the age of the Crusades. The biography of Simon of Trier is a fine example. Simon was an avid traveler. The distance he covered is quite astonishing for an age in which travel was known to be hard and hazardous. Born in Byzantine Sicily, Simon ended up as a saint in Catholic Trier. His extensive trips, his knowledge of languages, and his acquaintance with different cultures, made him a mediator between East and West. It would seem that Simon’s journeys did not obstruct his long-life ascetic quest; on the contrary: travel and ascetic life were for him two means of religious perfection. Simon’s Vita was commissioned by Poppo, Archbishop of Trier, in order to promote Simon’s sanctity. It was written down by Eberwin, Abbot of Tholey, who met Simon on his way back from his pilgrimage to Jerusalem. Written shortly after Simon’s death, the work was based on conversations with him and with others who knew him. The Vita was published by Mabillon in 1701 (Acta Sanctorum, Junii 1:89-95). 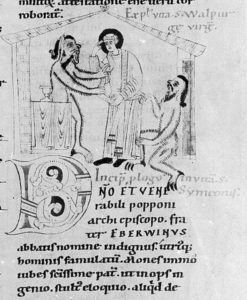 Around thirty manuscripts of the Vita are known today; most of them date to the 11th-13th centuries, attesting Simon’s popularity at the time. As far as I know, a more recent edition does not exist. The first part of the vita, describing Simon’s life until he became a hermit at Trier, was translated into German by Peter Thomsen in the ZDPV 62 (1939). I am not aware of a full translation or a translation to other languages. While the Vita is quite detailed, it does not tell us the dates of Simon’s travels, how long he spent in each place, nor any information about the places themselves. Yet, some of his meetings with known people enable us to reconstruct loosely the course of his life and travels. Simon was likely born in late tenth-century Sicily. His father was Greek, his mother Calabrian. At the age of seven Simon’s father brought him to Constantinople, where the child was subsequently educated. Later, he joined western pilgrims on their way to Jerusalem and got to know the holy places so well that he spent seven years guiding pilgrims (per septem annos ductor peregrinorum fuit). 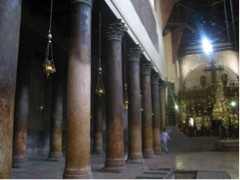 Simon then became a disciple of a hermit on the bank of the Jordan, lived for several years as a monk at Bethlehem, and then several years at the monastery of Saint Catherine in Sinai. From the latter, Simon left for a small cave on the bank of the Red Sea, where he lived for a few years as a hermit on bread supplied every Sunday by a monk from the monastery. Seeking respite from the many visitors to the cave, Simon returned to Saint Catherine. 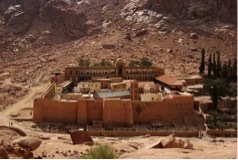 After living some time in the remote small cloister on top of Mount Sinai and as a hermit in the desert, he was asked by the abbot of St Catherine to go to Normandy to collect the yearly donation promised by Duke Richard II (963-1026), who was a great supporter of the holy places. En route, in Antioch, Simon met the large group of pilgrims led by Abbot Richard of Saint-Vanne, Verdun, on their way back from the Holy Land (1026). He became attached to Richard, whom he adopted as “father”. Traveling with the pilgrims through Rome and Aquitaine, Simon reached Normandy but found that the donation could not be collected, as Duke Richard had died. Simon then traveled to Angouleme, where he met Ademar of Chabbanes (a meeting that probably spurred in Ademar the decision to set out on pilgrimage to the holy places) and to Verdun, where he again encountered Abbot Richard. Simon then arrived at Trier, and, at the request of Poppo, Archbishop of Trier, joined him on his pilgrimage to the Holy Land. Returning at last to the East, although without the money he was supposed to collect, we would have expected that Simon would head back to St Catherine, from where he was sent. 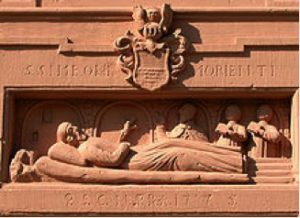 But Simon opted instead for the West, returning to Trier with the archbishop (1030). 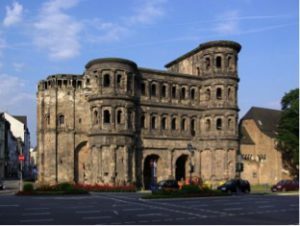 There, he asked to be enclosed in a small cell up the Porta Nigra, the old Roman tower gate of the city. For five years, Simon lived there as a recluse, praying and fasting, a holy hermit in the noisiest part of the city, utterly detached from the hubbub of life pulsing beneath and around his cell. Renowned in the region for his extreme asceticism, he died in 1035 and was buried in the cell where he was enclosed. Simon was soon sanctified, after miracles took place near his tomb, which became a pilgrimage destination – pilgrimage to a life-long pilgrim. 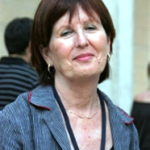 Brouria Bitton-Ashkelony, Encountering the Sacred: The Debate on Christian Pilgrimage in Late Antiquity, Berkeley: University of California Press, 2005.